As you may know, aere has started a #happinesstome project on Instagram, a move to reflect and share on the things that make us happy. For this campaign, the aim is to appreciate the basic senses that we have been blessed with. It’s through these senses that we are able to feel, and truly lucky we are, because some people were born without these senses. And some had them taken away. I was blown away by the artistic direction of this video. When I asked some people what happiness meant to them (in relation to the senses), I got a lot of answers that I didn’t expect. And it is these answers that are in the video. The smell of coffee in the morning, snuggling around with their favourite pet, being lost in reading a book, the smell of her favourite perfume, these little things define happiness to some. Sometimes, when we are facing so many things all around us, we do not realize the happiness that surrounds us. We get too engrossed in our so-called problems that we forget to smile, we forget to be content with all the gifts that have been given to us. Sometimes we forget that we are so blessed with so many things. #happinesstome is a reminder to all of us that there are so many things for us to be happy about. It reminds us that through whatever challenges that we have to face, the stresses that we have to go through on a daily basis, we should never forget to smile and be content for all the gifts that we have been blessed with. Slowly, we learn to expect the unexpected. On Instagram, the video teasers had to be strategically cut according to the senses. But, it’s all part of one full and whole video by aere and I really love the end product. It just gives out a powerful message that’s too hard not to miss. So what is #happinesstome? Well, a lot of things in the video I can really relate with. I really do hope that the video will touch your heart and soul in some ways or the other because... it definitely touched mine. So, what is happiness to you? Let us remind each other that there are so many things to be thankful and grateful about no matter what we are going through in life. There are so many things in life that we are blessed with that money can't buy. Share this video and spread your happiness with those around you. 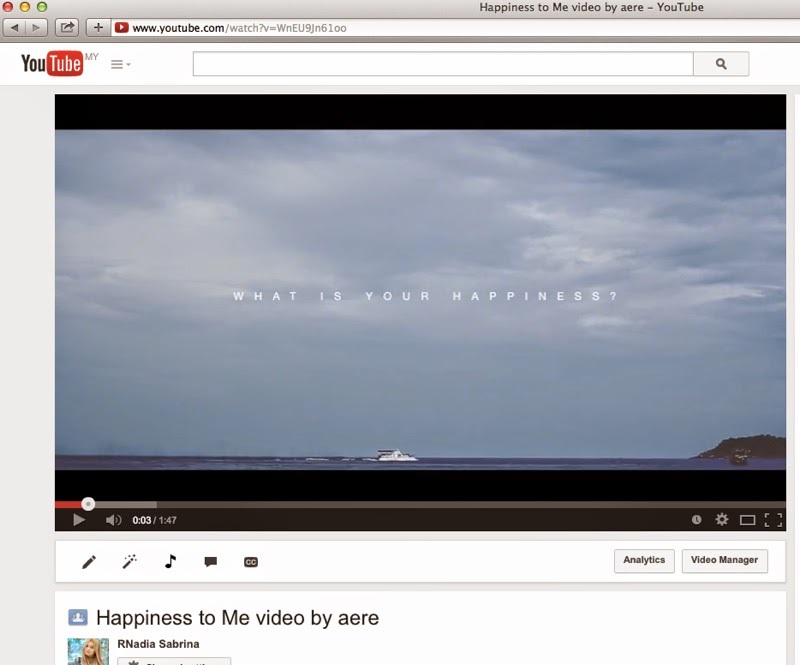 Or better yet, share it with me too and join in the online campaign and tag #happinesstome and @aere.